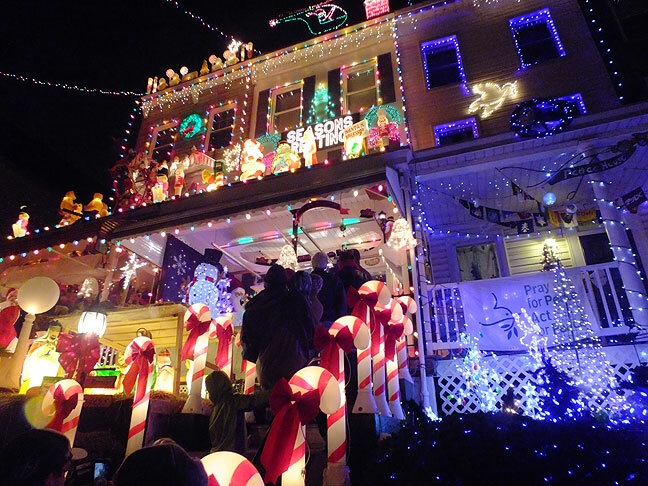 Christmas decorations fill houses and yards in the Hampden neighborhood of north Baltimore. 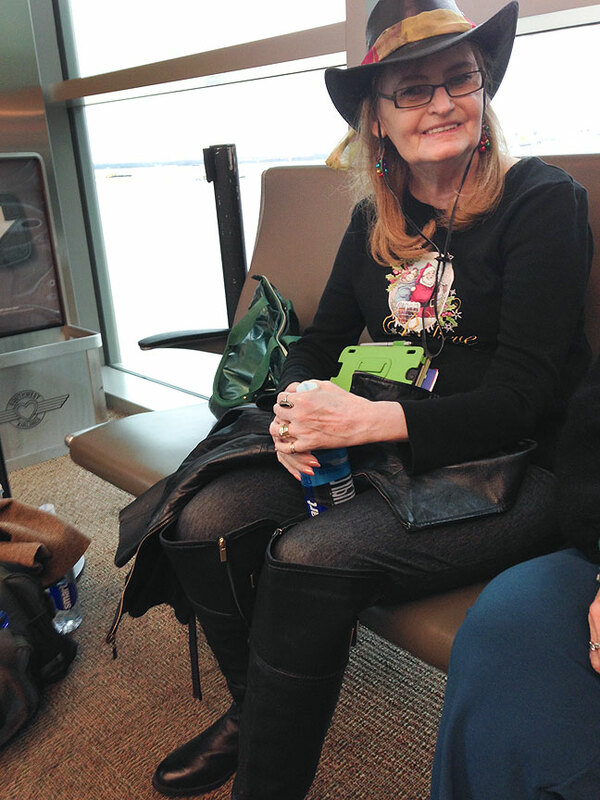 Abby smiles as we prepare to board our Southwest Boeing 737-700, a new jet that featured free wifi television on our mobile devices. Abby and I flew to Baltimore to spend Christmas with Abby’s daughter Chele, her husband Tom, our grandson Paul Thomas, and Tom’s extended family. 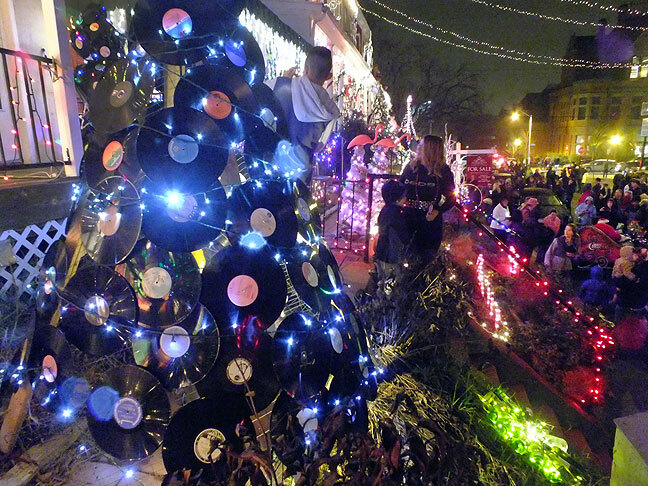 Items on our to-do list included a Christmas Eve gathering, a traditional Christmas morning, eating at Baltimore’s famous Bel-Loc Diner, seeing Star Wars: The Force Awakens, searching locations where portions of the film The Blair Witch Project was filmed, and visiting Baltimore’s storied Hampden neighborhood to see and photograph Christmas lights. 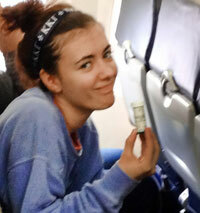 Janie holds the bottle of cat tranquilizers. 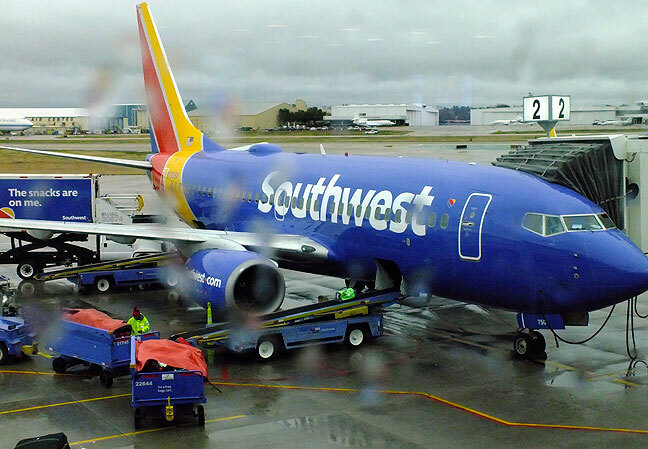 As usual, Abby and I chose Southwest Airlines, not only because we love their service, but also because Southwest’s biggest hub is now Baltimore, so we can usually get direct, affordable flights from Oklahoma City. In the gate and during boarding, Abby and I thought we heard a cat, and as our jet started to taxi, we discovered that a young lady named Janie was traveling with her cat Tiger, who, despite being tranquilized, chewed out of his carrier. Regulations prohibit having loose animals in the cabin, so we had to taxi back to the gate. To Southwest Airlines’ credit, they had a fresh carrier waiting, and the delay was less than 20 minutes. 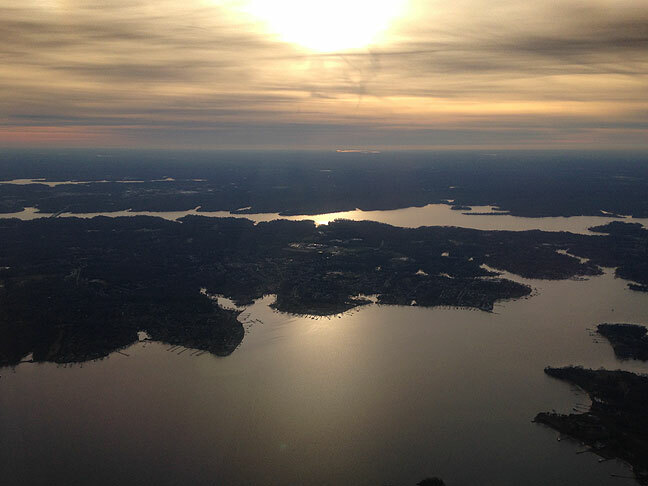 The Patapsco River inlet shines in late afternoon light as we arrive at Baltimore/Washington International Thurgood Marshall Airport. Chele and Abby have a cordial conversation on the day after we arrived. 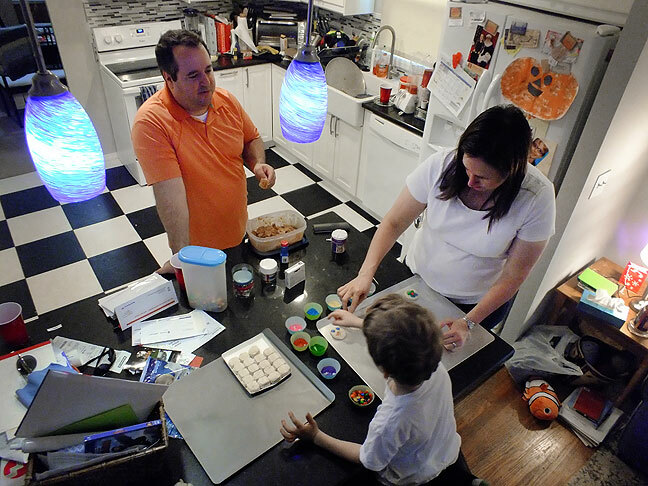 Tom and Chele help Paul decorate cookies to leave out for Santa on Christmas Eve. 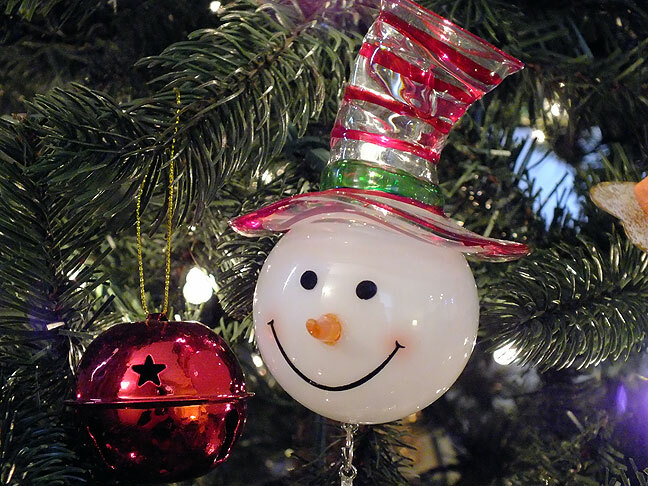 One of our top tier items on this visit was to spend Christmas Eve with Tom’s extended family. Activities included a huge buffet meal, a mystery Santa gift exchange, and gifts for everyone, especially the children. 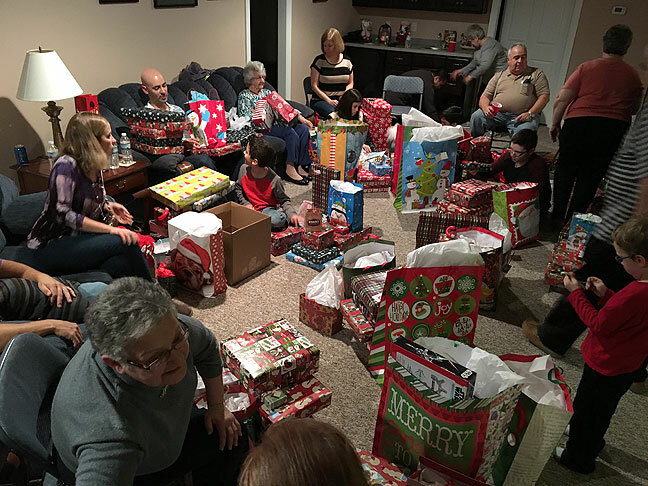 The whole family gathered in the downstairs den at Tom’s mother’s house to exchange gifts. 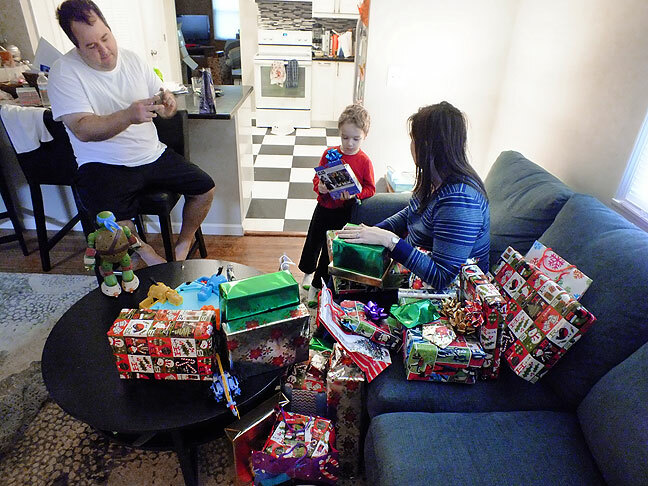 Tom, Paul and Chele prepare to open gifts on Christmas morning. 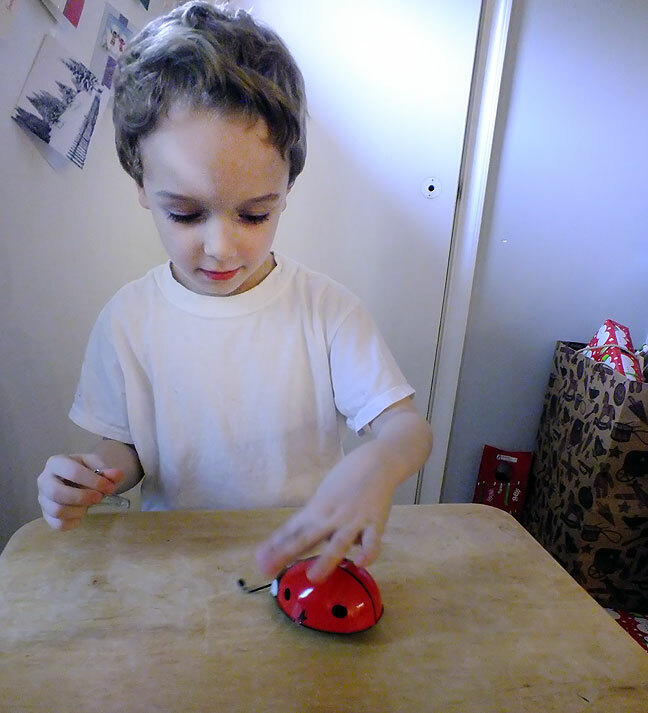 Paul plays with a metal, mechanical ladybug we bought for him for Christmas. A gear in the toy connected to its antennas prevent it from running off the edge of the table. It was made in the Czech Republic. 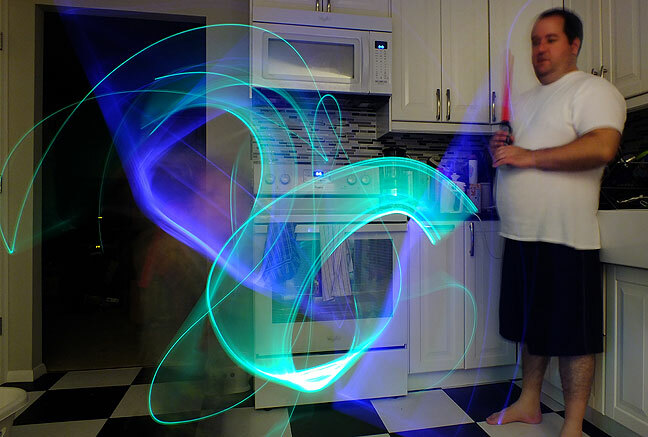 Paul and Tom have a light saber battle in the kitchen. One of Paul’s Christmas gifts was a modular light saber kit. 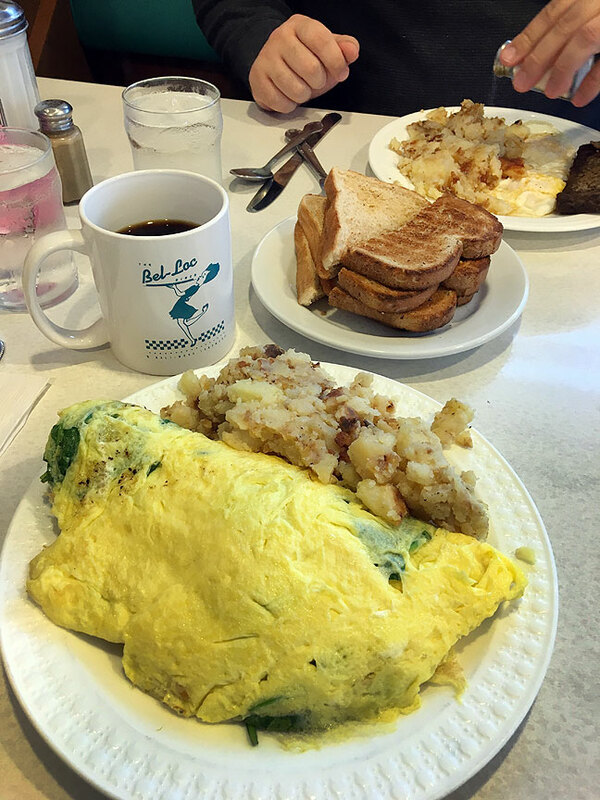 On our way to hike and explore at Seneca Creek State Park, Tom and I had a bite of breakfast at the Bel-Loc. The omelette was really good, but the home fries were pretty bland. Tom likes a Bel-Loc specialty called scrapple. At the corner of the Beltway and Loc Raven Boulevard near Chele and Tom’s house stands the Bel-Loc Diner. Abby and I fell in love with the place in 2009 when we were in Baltimore for Chele and Tom’s wedding and stayed at a motel across the street from it, having breakfast there most days. I admit that most of my love of the place is nostalgia, since the food is so-so at best. But we all love it. Tom has a fun ritual at the Bel-Loc: he orders scrapple and eggs with rye toast, and when the eggs are gone, he makes a scrapple on rye sandwich. I love the neon signs at the Bel-Loc, but will never again be able to photograph them at night, since they are now only open for breakfast and lunch. 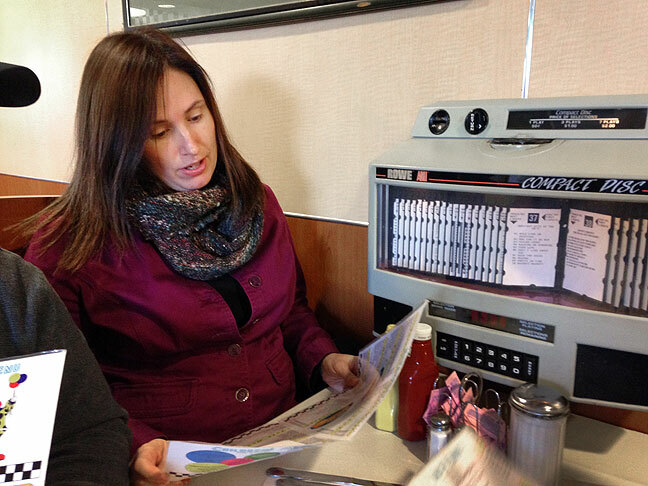 Chele looks over the menu at the Bel-Loc Diner. A huge event nationwide during our visit was the release of Episode 7 of the Star Wars series, The Force Awakens. I saw the first Star Wars film (later called A New Hope) in 1977, and Tom is a life-long superfan. Tom and Chele had taken Paul to see it a few days earlier, but were happy to take Abby and me to see it again. We saw an 11:30 a.m. show, and it wasn’t at all crowded. Reviews of the film varied, but we all agreed that it was fun and engaging, and I would be happy to see it again, and eventually own the DVD/Blu-Ray/FutureMedia of it. 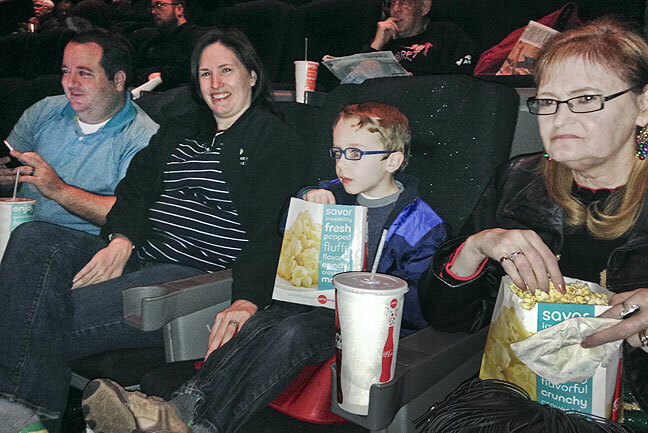 Tom, Chele, Paul and Abby wait for the start of Star Wars: The Force Awakens. The early show was deeply discounted, so Abby’s Coke and popcorn cost as much as our tickets. This is a clip from the early parts of The Blair Witch Project when they pass a small building on their way to the woods. I have always been a big fan of the horror film The Blair Witch Project. I don’t generally care for the genre, but Blair Witch was awesome. 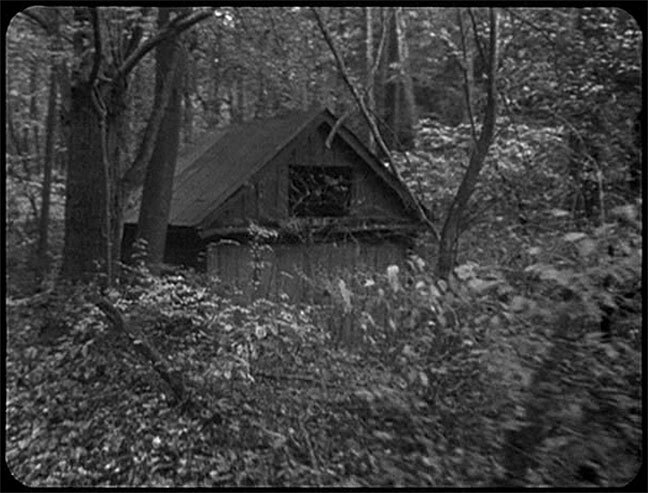 Many of the seminal scenes for the movie were filmed in Maryland’s Seneca Creek State Park and nearby Black Rock Mill, not far from Tom and Chele’s home in Baltimore suburb Parkville, so I vowed the next time we visited Maryland, we should make it a tier one item to see the location. 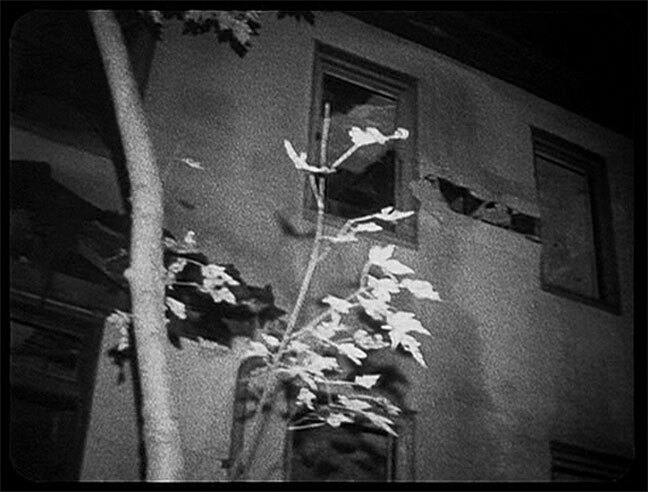 This is my image of the building on the Black Rock Road. It is red. The number one kind of visitors we saw in the park were runners, followed by fishermen. 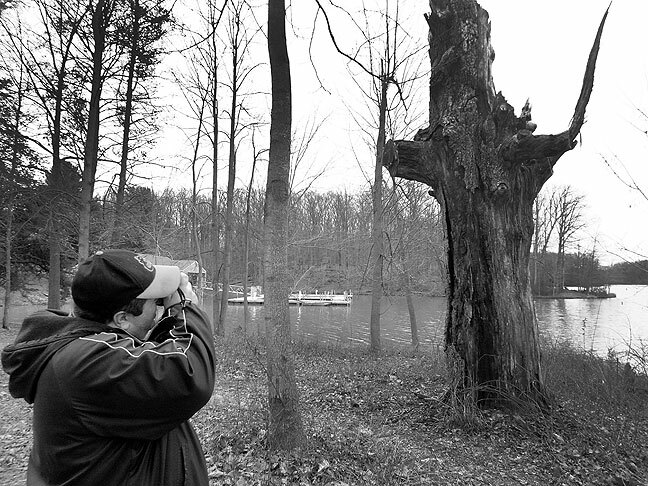 Tom and I took the three-mile Lake Shore trail around Clopper Lake and get a feel for the scenery and enjoy the day, which was warm and cloudy. The woods and streams around the lake looked just like the scenes in Blair Witch. Black Rock Mill has been fixed up and turned into a historic site, but we could still tell how it was used in the film. This is the Black Rock Mill as it appears today. 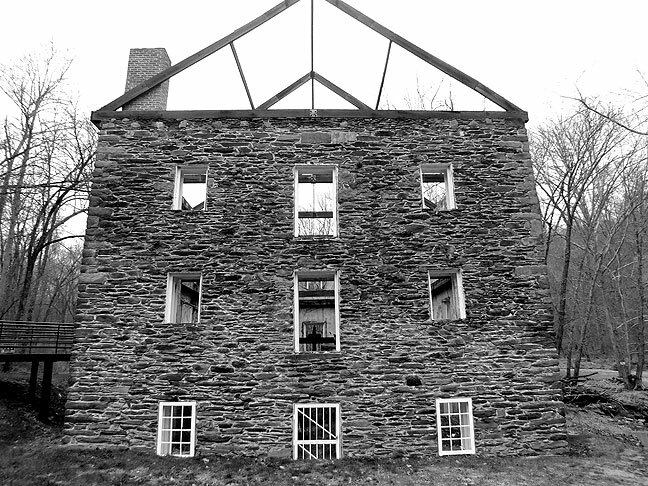 This is a moodier rendering of the Black Rock Mill. 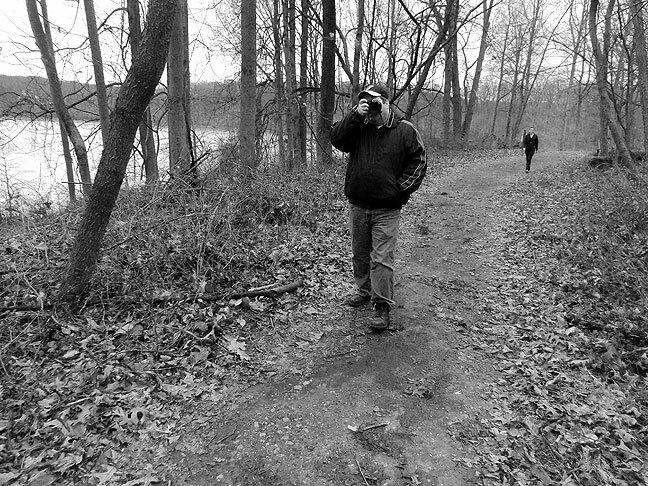 Tom makes pictures on the Lake Shore trail. 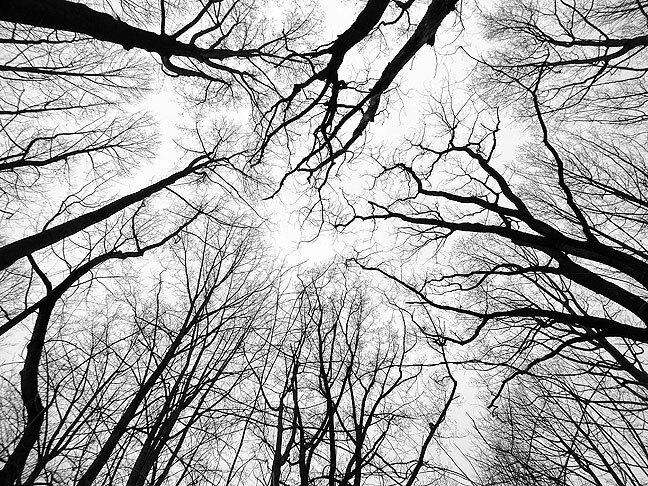 This view looking straight up conveys the essence of the western Maryland woodlands. 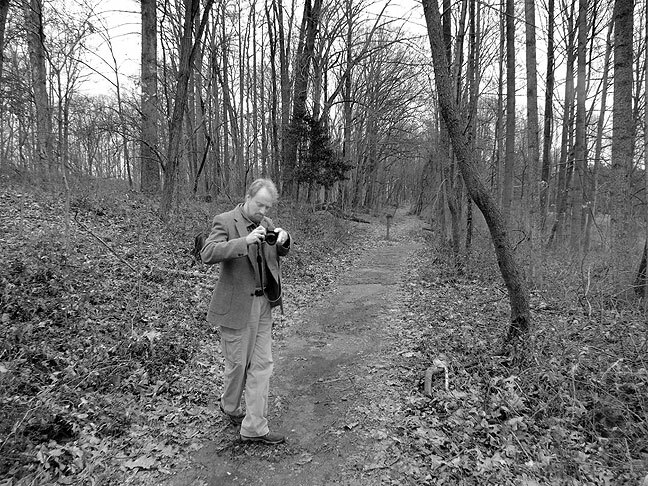 Tom photographed me making some video. 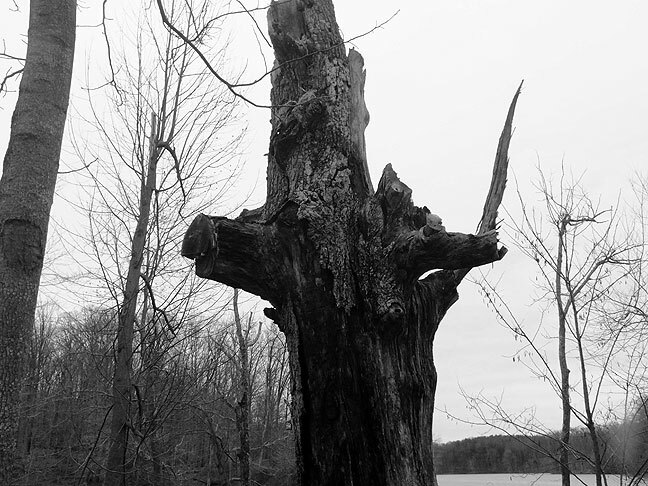 Tom photographed this super-creepy-looking tree stump by Clopper Lake. 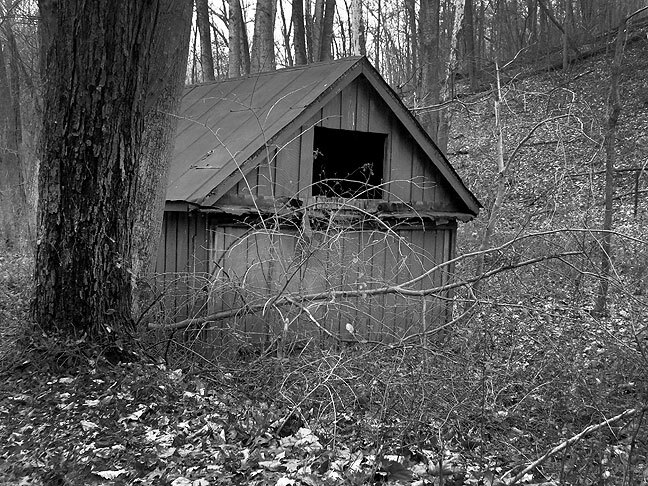 It was easy to see how the makers of The Blair Witch Project might have found these scenes to be spooky and haunted, particularly in the off-season when the ground is covered in leaves and the branches are bare. 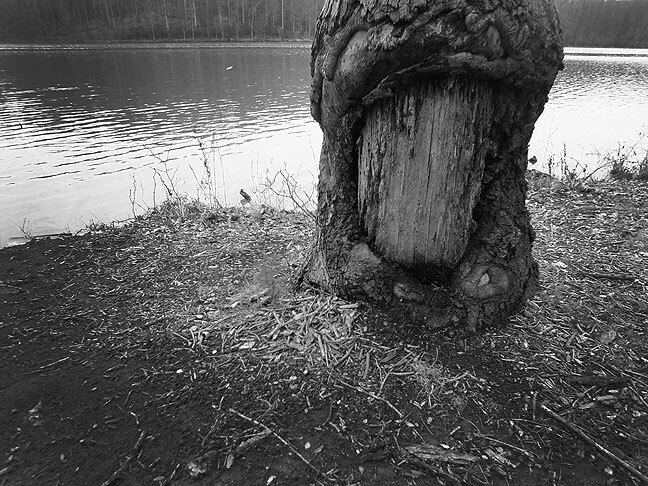 I think this looks like a big tree eating a smaller one. 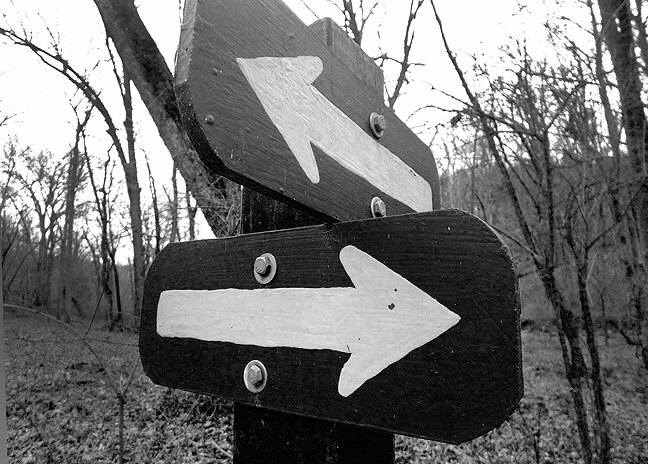 Signs like these point to a comic irony about the possibility of getting lost in the woods. I know this doesn’t look like The Blair Witch Project as much as it does Deliverance. 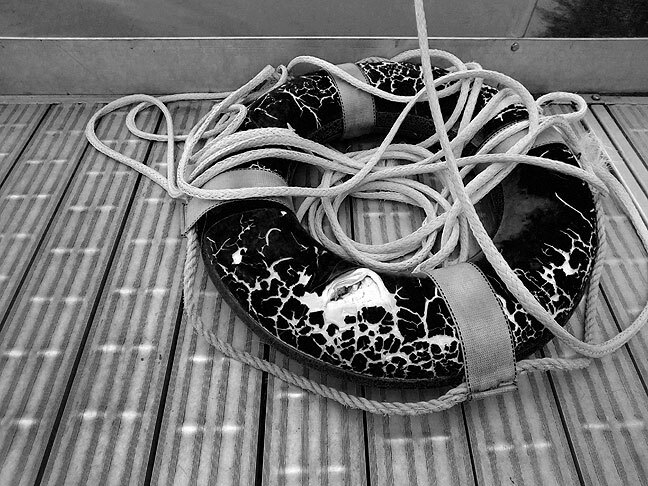 We found this oddly-weathered life ring on a dock at Clopper Lake. 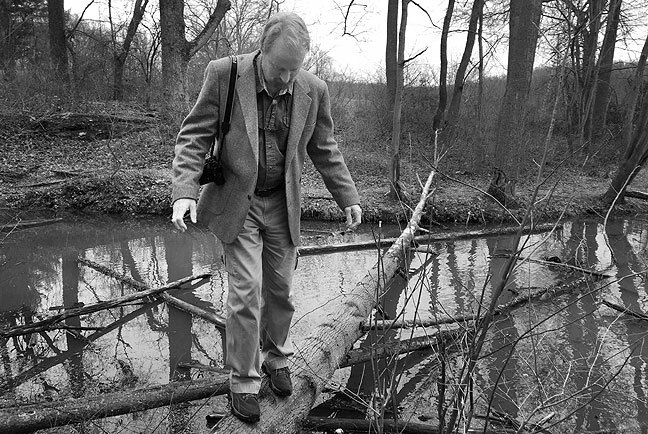 Tom photographed me balancing on a log over a creek, though not much like the one in Blair Witch. 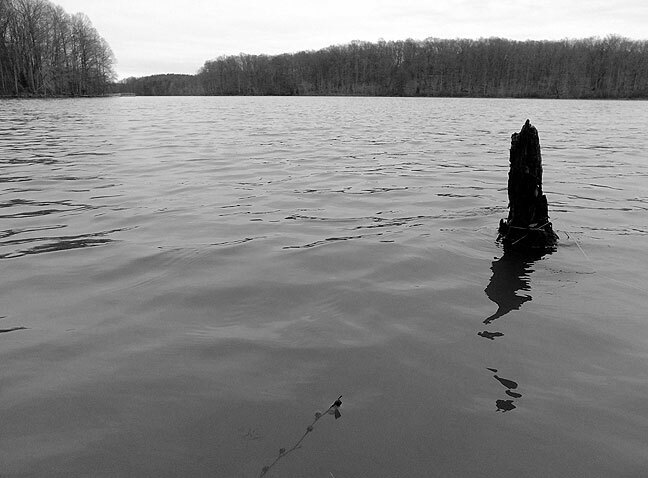 The only thing we could find that seemed symbolic or supernatural in any way was this odd, water-filled cut in a stump. 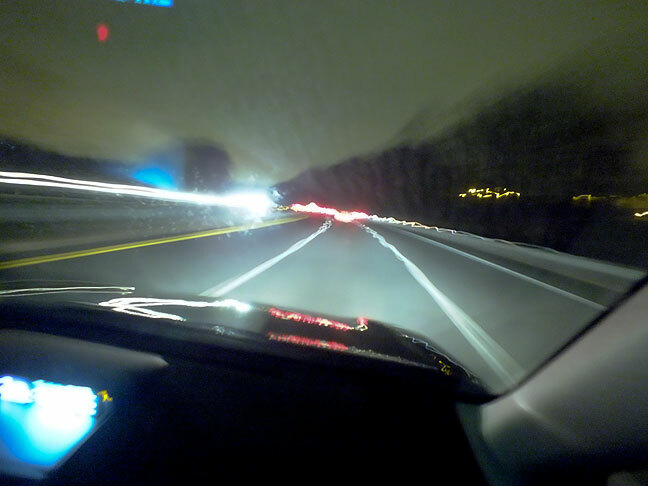 This was the view of the highway at night as we drove to Hampden. 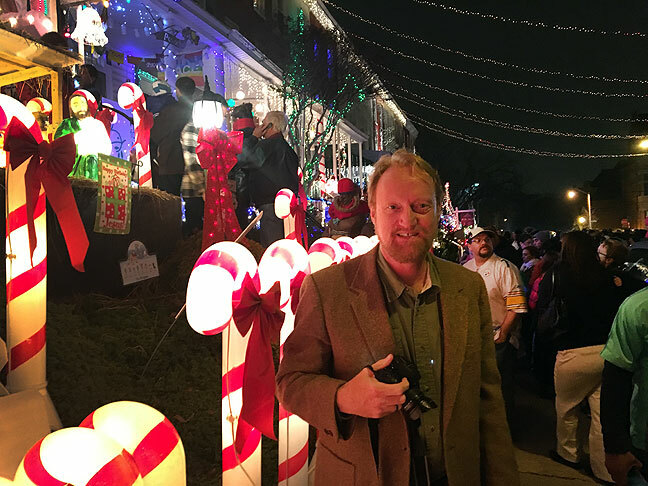 Tom and Chele both suggested this attraction, an affluent neighborhood called Hampden in north Baltimore in which the residents try to out-Christmas each other as lavishly as possible. Spanning only one block, the lights at Hampden are easily the most over-the-top lighting display I have ever experienced. 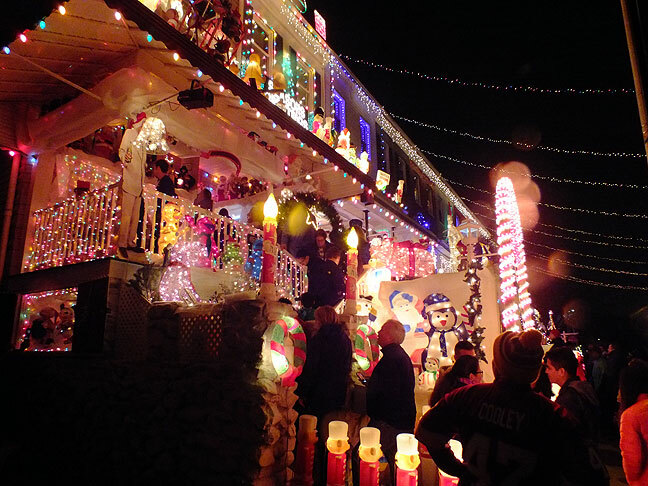 Though not an official event of any kind, it was clear that this was the place to see lights in the Baltimore area, and if I had to guess, I’d say there might have been 2500 people there when we visited. Visitors shuffle up stairs to see more items on display on a resident’s porch at Hampden. 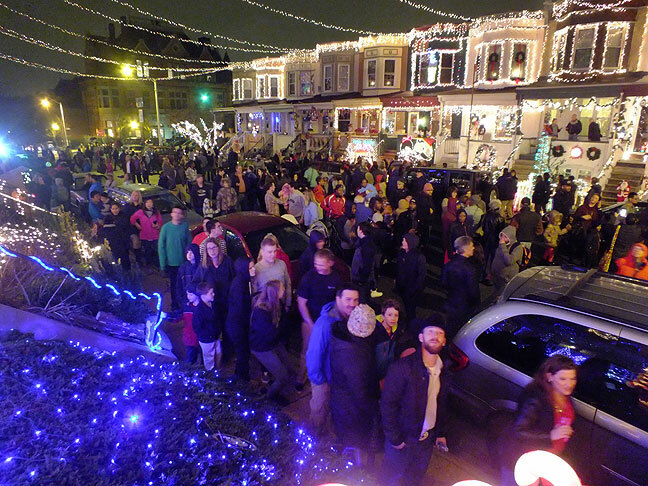 This view shows the row houses in Hampden covered in lights. 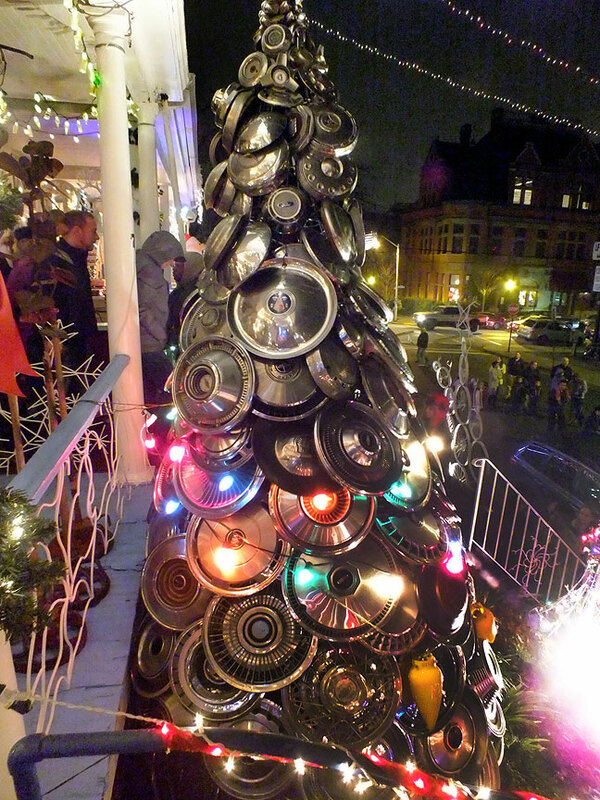 … a Christmas tree make of hub caps! 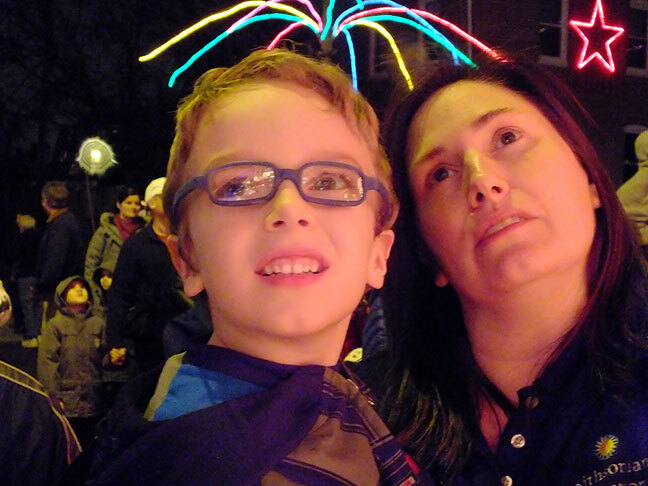 Paul and Chele look at the lights of Hampden with awe. 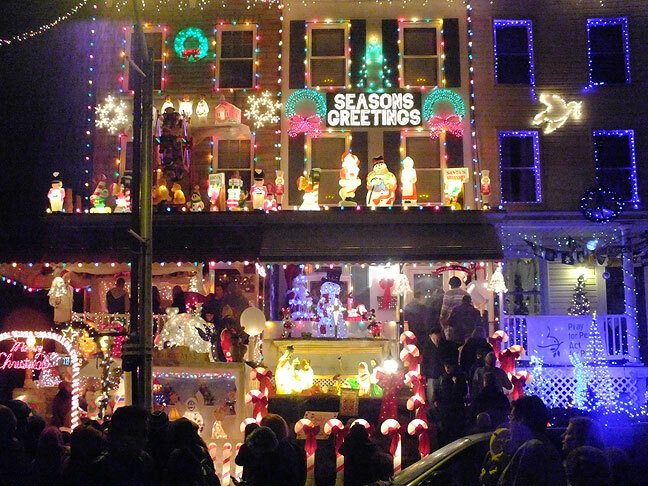 This view looks across the street at more Hampden lights. 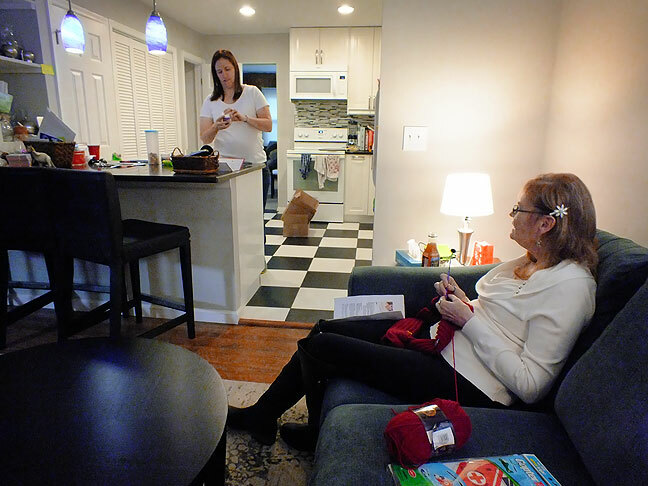 Since Abby is now retired, she was able to stay an extra week in Baltimore. Since I had work on Monday, I flew home on Sunday, Dec. 27, straight into the teeth of Winter Storm Goliath. Chele drove me to BWI at about 5:45 a.m. 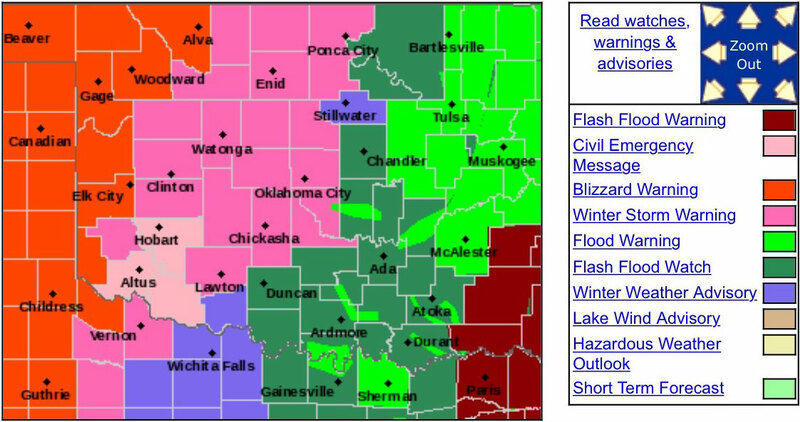 This is the watch and warning web graphic for the National Weather Service in Norman, Oklahoma, for the night I arrived. I have never seen a crazier combination of items, which even included two civil emergencies. The first hitch came on the Baltimore to Dallas Love Field leg of my flight, which seemed normal except that the Southwest.com page on my phone kept extending the arrival time. At first I felt certain it was a time zone glitch, but by the time the map showed us south of Dallas, the flight crew announced we were diverting to Houston for fuel and to wait out severe weather in the Dallas area. With all this going on, the dude next to me never woke up, and twitched in his sleep like he was having a seizure. As we tanked up, a gate agent called all us Oklahoma City passengers together to offer us a 4:45 flight direct to OKC, or we could proceed to DAL and take our chances, which we all did. We taxied out and shut down on a taxiway, where the flight crew said we would wait for 45 minutes. Eventually we departed, but the flight map on my phone showed us as far west as Abilene, Texas before we turned east to Dallas. 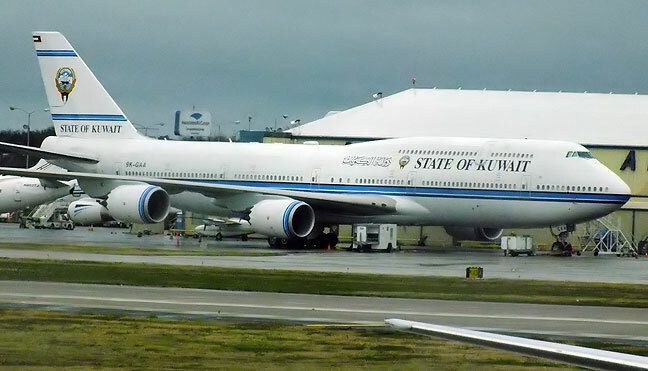 During my long but pleasant wait at Dallas Love Field during which I had vegetable egg rolls and a smoothie, I spotted this State of Kuwait Boeing 747-800. According to airliners.net, this aircraft is in the process of being customized at Associated Air Center. Despite all the potential to be frustrated by travel issues, I still kept in mind that it was Christmas, and we were all in it together. I arrived about 30 minutes too late to make my 11:30 a.m. connection to Oklahoma City, but a helpful, exhausted gate agent put me on 1:30 flight. I then got a text saying it was delayed until 3:30. Then 5:30. Then at 6:15, as we began boarding, a gate agent announced that a mechanic was on board and diagnosing a problem. I thought surely it would be followed by, “Just kidding,” but it wasn’t. We pushed back at a few minutes before 7 p.m. I helped a nice lady by lifting her carry-on into the overhead bin for her, and we struck up a conversation. Her name is Judy McCombs, and she is an artist in Chickasha, Oklahoma. She was nervous about the flight, but between chatting and my reassurances, she did fine. The flight attendants told us they wouldn’t be serving us because the ride would be “a little bumpy.” As a pilot, I can tell you that one man’s “bumpy” is another’s “rough,” and though it was never frightening, it was, as my flight instructor used to say, “rough as a cob.” Juuuuuussssst as we popped out of the cloud base on final to OKC, a man four rows in front of us blew his chow. Apparently he’d just finished off a 72-ounce steak with all the trimmings, because he yell-blarfed into his bag for the remaining 90 seconds of the flight. Props to Southwest Airlines for getting me home in the middle of a crisis period, politely and comfortably. Finally on the ground, I bid farewell to the lovely Judy and went to baggage claim, where my suit case, mostly full of Abby’s stuff she sent back with me so she wouldn’t have to deal with it on her flight, was soaking wet from the rain. At the truck, I discovered that parking on the top floor of the parking garage scientifically verifies that bridges and overpasses ice up first, as there was a half inch of glaze ice on every surface of the truck. After 15 minutes, I had it clear enough to drive, and discovered that I was just in time to miss the brunt of the storm, as only bridges were beginning to ice, and as I drove east and temps creeped above 32, the threat of ice dissipated, and I arrived home safely by about 10:30 p.m. This is the ice with which I contended after 15 hours of airliner seats and terminal seats. 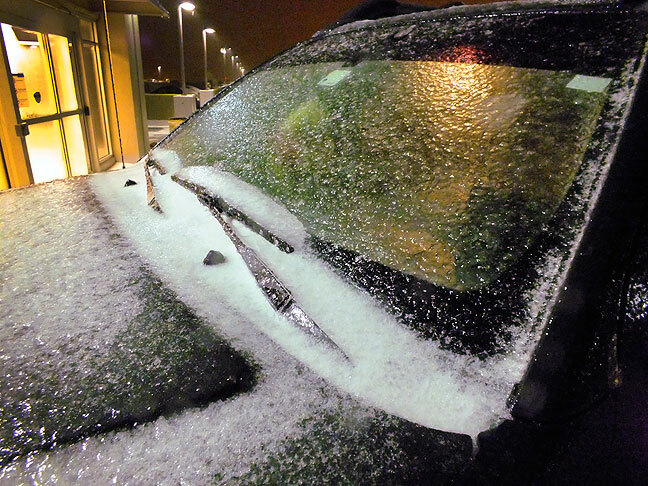 Fortunately, we had two full bottles of Prestone windshield deicer on board. 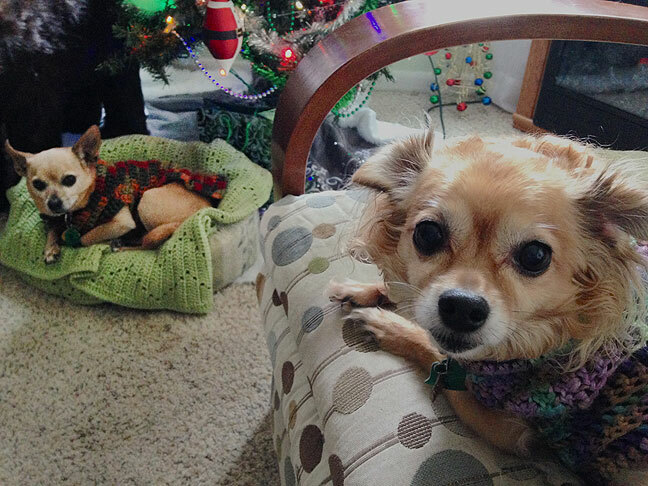 I was certainly happy to be home, and our dogs were delighted to be out of dog jail. Your host prowls the streets of Hampden, looking for great photos. All of this is just dripping with awesomeness. What camera/lens did you use most of the time? Abby and I (and sometimes Tom) shot everything with our matching Fujifilm HS30EXR cameras. My heart goes out to Mr. Yell-Blarfer, and to you, for your travel troubles. That Reeves family gathering looked epic, as did your Christmas morning. I wonder if Paul will keep his ladybug forever. Entertaining trip report, as usual. I very much enjoyed the photographs from your trip. This is a case of the trailers/previews being very specifically made to keep me from seeing the film. While I admit it’s possible I would enjoy it, I would need convincing that none of the scenes from the trailers/previews are actually in the movie. I’m grateful to have never seen/heard this on an airplane. In fact, I think the only times I’ve ever seen complete strangers vomit (not counting in night club bathrooms) was while working car accidents as a reporter. 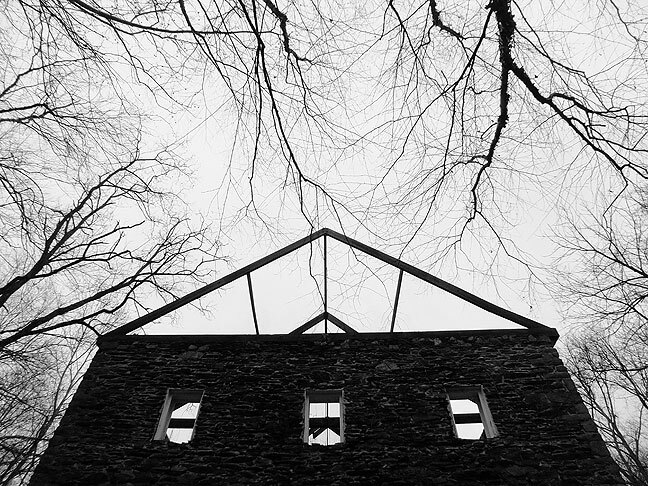 I love that all the Seneca Creek and Black Rock Mill photos are in black and white. The carving in the tree stump is especially interesting. 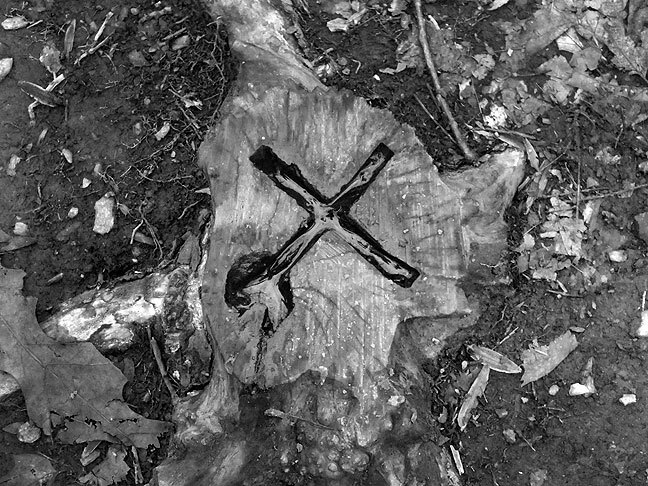 I know that, around here, when people use a chainsaw to clear forest trails of fallen trees, they often carve their initials into the exposed end of the tree. I’ve never seen anything as elaborate as the “cross” in that stump, though. I’m fairly certain that if I’d been on the same plane as the yell-blarfer, I’d have engaged in some sympathy-spewing.